Alessia is a Technical Evangelist at Unity. 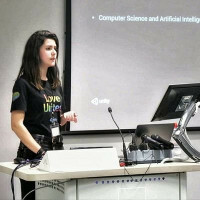 She started developing small games at game jams and hackathons, and she joined Unity in 2017 to develop and demonstrate feature projects and share tips about Unity at conferences and meet-ups around the world. As a gamer, she is passionate about immersive story-based adventures and anything experimental. Unity Machine Learning Agents is the revolutionary plugin for those who wish to turn their scripted game AI into a neural network-trained agent able to make reasoned decisions. The session focuses on the implementation of the ML-Agents into an existing Unity projects. The talk includes a quick introduction to Machine Learning that does not require any prior knowledge on the topic. Alessia will cover how this is approached by Unity and how to get up to speed with the API efficiently. You will be introduced to exciting examples of what has been done with the ML-Agents, and then look at a feature demo breakdown to understand how it all works within the engine. The session aims to provide you with the tools necessary to understand and start working with Imitation Learning and the workflow of neural network training based on a Unity environment.